In the Faculty Innovation Center, the Teaching and Learning Design (TLD) team provides support for faculty members and instructors who wish to discuss issues and ideas related to learning design, innovations in instruction, approaches to designing online or hybrid learning experiences, student engagement, and inclusive teaching. Members of the TLD team offer a range of services, from individual consultations with faculty members and instructors, to general and customized workshops for faculty, instructors and departments. They also develop, coordinate and sustain campus-wide programs tied to institutional priorities and initiatives. 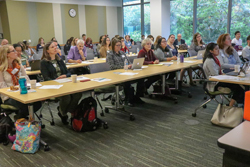 On Monday, November 5th, TLD member Adria Battaglia convened the second annual Inclusive Teaching and Learning Symposium in the Glickmann Center. 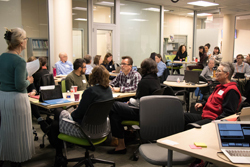 On Tuesday, November 13th, TLD members Anne Braseby and Adria Battaglia offered a workshop on Collaborative Learning, the second in a series this past fall. On Friday, November 30th, TLD members Matt Russell, Anne Braseby, and Adria Battaglia gave a presentation at CanvasCon Austin on the Deeper Dive Instructional Guides (DDIGs) that they created in Canvas. Have a lovely holiday break! The TLD team will see you next semester with additional workshops and opportunities to interact. 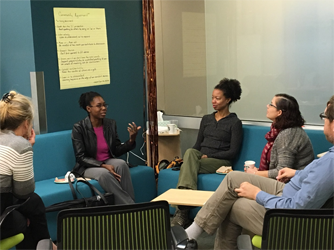 At New Faculty Symposium the faculty participated in a workshop on how to observe a peer in the classroom. They chose an aspect of teaching to observe and collect data to share with their partner. On Tuesday October 23rd TLD members Anne Braseby and Adria Battaglia reconvened to discuss how their first semester was progressing and discuss what they had learned from their peer observations. 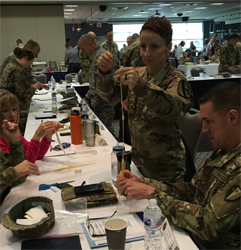 TLD members Adria Battaglia and Matt Russell were invited to Goodfellow Air Force Base in San Angelo, Texas to consult on integrating more active learning into their curriculum. They gave a two-hour presentation to over 60 commanders and over 40 faculty developers/trainers. 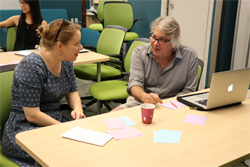 Additionally, they facilitated a three-hour workshop, observed two classes, and made some invaluable connections with folks deeply vested in education. In October, TLD member Matt Russell accompanied faculty from UT and the Centro Universitário Adventista de São Paulo (Brazil) to present on their work in Global Classrooms at the AAC&U Global Engagement and Spaces of Practice in Seattle. In September, TLD team lead Anne Braseby presented a Collaborative Learning Workshop (workshop participants pictured left). This was the first in a series of three that identifies three different “layers” of collaborative learning: Working in pairs, Working in groups, and Working in teams. Each layer has added complexity for the students and for the instructor. 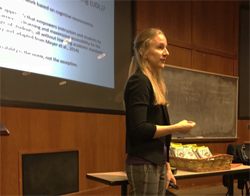 In September, TLD team member Adria Battaglia (left) partnered with the Graduate Student Development team in the FIC and offered two workshops serving over 80 graduate students on the topic of Universal Design for Learning. In October, we’re offering UDL workshops for a variety of faculty in different departments across campus. For a customized teaching and learning workshop for your department, on UDL or other topics, please contact the TLD team for more information and options!